For other Marvel Comics characters called Electro, see Electro (comics). Electro (/ɪˈlɛktroʊ/) is a fictional supervillain appearing in American comic books published by Marvel Comics. Maxwell "Max" Dillon, the first Electro, is an enemy of Spider-Man who gained the ability to control electricity after being struck by lightning while working on a power line. Electro has since become one of Spider-Man's most enduring foes, becoming part of the collective rogue team known as the Sinister Six. The second Electro is Francine Frye. In 2009, Electro was ranked as IGN's 87th Greatest Comic Book Villain of All Time. The character has been depicted in numerous Spider-Man cartoons and video games and made his cinematic debut in 2014's The Amazing Spider-Man 2, portrayed by actor Jamie Foxx. Electro's first appearance, The Amazing Spider-Man #9 (Feb. 1964). Art by Steve Ditko. The Maxwell Dillon version of Electro was created by Stan Lee and Steve Ditko, and first appeared in The Amazing Spider-Man #9 (Feb. 1964). The character is also known as the member of the Frightful Four battling the Fantastic Four. He is also the first major Marvel villain to be written in publication history as battling Daredevil, even being the founder and leader of the supervillain team that oppose him, the Emissaries of Evil. Max Dillon, as he originally appears. Interior artwork from Amazing Spider-Man Annual#1 (October 1964 ).Art by Steve Ditko. While Maxwell Dillon, an electrical engineer and lineman, was repairing a power line, a freak lightning accident caused a mutagenic change that transformed him into a living electrical capacitor. His powers were initially weak, so he spent some time stealing electrical equipment from Stark Industries to charge himself. During this time, he was approached by Magneto, who considered him a potential recruit for his Brotherhood of Evil Mutants, claiming that Dillon's power rivaled his own, but Dillon refused. The following day, Dillon was confronted by a small-time thug from whom he had been borrowing money to pay for the machinery he had needed. When the thug drew a gun on him because he had not paid back the money yet, he responded by shooting a blast of lightning through the thug's chest—the first time Dillon ever killed anybody. Soon taking the name "Electro", he turned to a life of a professional criminal, his first victim being J. Jonah Jameson. Electro broke into the Daily Bugle Building and stole from Jameson's safe right in front of him. Jameson accused Spider-Man of being an alternate identity of Electro, prompting Spider-Man to prove the publisher wrong. During their first ever confrontation, Spider-Man was nearly killed after touching the electrically charged villain. Spider-Man eventually used a fire hose to short-circuit Electro while wearing rubber gloves to protect himself. Electro next confronted Daredevil for the first time when trying to break into the Baxter Building. He was again defeated. Electro later joined the original Sinister Six, and was the first member of the group to fight Spider-Man, battling him at a Stark plant, when Spider-Man dodged a bolt of electricity he realized his powers had returned. Electro lost his power when the power was cut off by Spider-Man. Spider-Man got a card from him that led him to fight Kraven the Hunter. Electro attacked the Fantastic Four at the wedding of Sue Storm and Reed Richards, under the control of Doctor Doom's mind-control machine, but due to Mister Fantastic he, like the other villains, has no memory of the incident. He later recruited the second Emissaries of Evil in a plot of revenge against Daredevil for previous defeats. This group consisted of Gladiator, Stilt-Man, Leap-Frog, and the Matador. Electro was later hired by J. Jonah Jameson to defeat Spider-Man on national television. He encountered Daredevil again in San Francisco, at which time he temporarily donned a modified costume. He then took control of a Protarian android seeking the destruction of Omega. Electro then teamed with Blizzard against Spider-Man and Daredevil. Electro then attempted to aid a band of criminals escaping the Defenders. Electro later joined the Frightful Four. As part of the Frightful Four, he used Spider-Man as bait to trap the Fantastic Four. Subsequently, he battled the Falcon but was defeated, partly because he did not consider the Falcon to be a serious threat. Electro later learned that he can electro-statically disrupt Spider-Man's wall-crawling ability. The Chameleon and Hammerhead then sent the Shocker to try to recruit Electro into their organization. Instead, he later accepted Doctor Octopus' invitation to rejoin the Sinister Six, and battled Spider-Man. Electro has fought Spider-Man countless times, either on his own or as part of a group such as the Sinister Six. He has also fought such other heroes as Daredevil, the Fantastic Four, and the New Avengers. Despite his immense power, he has almost always been defeated, usually as a result of his foes outsmarting him or taking advantage of his weakness to water while charged. As a result of his frequent and often embarrassing defeats, Electro tried to take over New York City's power supply in an attempt at glory and respect. Spider-Man thwarted this plan, however, and convinced Electro to quit his criminal career. When Kaine (Spider-Man's insane clone) started killing enemies of Spider-Man, Electro began to fear for his life and temporarily joined Mysterio's Sinister Seven, which had been formed to combat Kaine. This group was quickly disbanded, and following Kaine's subsequent disappearance, Electro returned to retirement. This changed when the Rose agreed to fund an experimental technique that would amplify Electro's abilities, in exchange for Electro's services as an enforcer. Seeing this as a chance to rise above the string of failures that had made up so much of his life, Electro underwent the procedure. After paying off his debt to the Rose by defeating several members of The True Believers (an offshoot of the famous ninja sect called the Hand), a group of ninja assassins who had been interfering in the Rose's operations, Electro attempted to demonstrate his newly amplified powers to the world, once again attempting to take control of New York City's power supply. Wearing an insulated suit, Spider-Man stopped him. Electro, in an effort to make a final grand gesture, threw himself into the Hudson River while his body was highly charged, seemingly killing himself in an explosion. Somehow surviving, Electro resurfaced later as part of the re-formed Sinister Six, formed to kill Senator Stewart Ward and Doctor Octopus (whom the other members of the Six now hated due to his arrogance). His powers had seemingly reverted to their pre-amplification level, and he wore a new blue-and-white costume. When Venom betrayed his fellow Sinister Six members, attempting to kill them one by one, he attacked Electro and left him for dead. Once again, Electro survived, and when he next appeared had returned to his yellow-and green-costume. Electro's new look in The Amazing Spider-Man. Art by Paul Azaceta. Later, separately, he was hired by the Skrull Pagon (posing as Elektra) to free Karl Lykos (also known as Sauron) from The Raft, a maximum-security prison for supervillains. After causing a riot, Electro tried to run away with his waitress girlfriend, but was captured by the New Avengers, subsequently fainting when faced with the prospect of being beaten up by Luke Cage, using Spider-Man's webbing to protect himself from Electro. Later, Electro joined Chameleon's "Exterminators", seeking to take advantage of Peter Parker and his loved ones. During the Civil War storyline, Electro was among the villains in Hammerhead's unnamed villain army when Iron Man and S.H.I.E.L.D. raided the hideout. In Secret Invasion, Electro appears as member of Hood's crime syndicate and attacked a Skrull force. After the Skrull posing as Jarvis kidnaps the baby of Luke Cage and Jessica Jones, the Avengers and the Fantastic Four begin going after everyone who is associated with the Skrulls. Because of this, Electro is confronted by Wolverine in an alley where, after a battle, he leaves Dillon beaten and unconscious. Electro returns in The Gauntlet, with a new look as his face is now scarred with lightning bolts. The revamp was explained by writer Mark Waid, stating that artist Paul Azaceta "tweaked the design a bit, adding some burn scars to reflect Electro's current situation. As Electro gets older, as his body chemistry starts to shift into middle age, his powers are becoming more erratic and less easy for him to control. So he turns to a surprise Marvel villain – someone rarely, if ever, seen in the pages of Amazing – to level up." During his appearance in "The Guantlet", it is revealed that Electro has lost control over his powers: besides the physical disfigurement, his touch is now 100% lethal. Depressed and angry at the world because of this, Electro begins gathering other outcasts and misfits into a group known as "Power To The People", which targets right-wing newspaper baron Dexter Bennett and the New York Stock Exchange in the wake of the 2008 Financial Crisis. Electro's group manages to gain positive coverage in the media, hampering Spider-Man's ability to convince Electro's followers of his true evil nature. Electro's duplicitous nature causes him to betray his followers in order to align with the amoral Bennett in exchange for help finding a way to restore his powers to a controllable level. The Mad Thinker is able to come up with a process to cure Electro, but Spider-Man interferes with the process, turning Electro into an artificial electrical thunderbolt. Furious, Electro double-crosses Bennett and ultimately uses his new powers to destroy The DB building, crippling Bennett in the process. In doing so, Electro uses up so much of his newfound power that Spider-Man is able to neutralize him with his webbing. In the epilogue, Electro runs into Sasha Kravinoff and Chameleon in his new jail cell. In the following issue involving Sandman, it is revealed that Electro has escaped. Under the orders of the Kravinoffs, he breaks the Vulture (Jimmy Natale) out of prison. 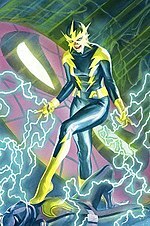 During the Heroic Age storyline, it is suspected by the Young Allies that Electro had a discarded and disavowed daughter named Aftershock (similar to the MC2 Universe version) who is a member of the Bastards of Evil. When Young Allies members Firestar and Gravity fight Electro, he defeats them and lets them live so that they can spread the message that he does not endorse Aftershock and the Bastards of Evil's terrorism. He also says they can look up how and when he got his powers on the internet and there was no way a girl of Aftershock's age could have been conceived after he got his powers: It's impossible for him to be Aftershock's father. Electro is later present at the scene where Mattie Franklin is sacrificed by Sasha Kravinoff as part of a ritual that resurrects Vladimir Kravinoff as a large humanoid lion creature. During the "Origin of the Species" storyline, Electro is among the supervillains invited by Doctor Octopus to join his supervillain team where they are promised that they will receive a reward in exchange for securing some specific items. Electro goes after Spider-Man for Menace's infant. Anticipating Spider-Man's plan to deliver the infant to a hospital, Electro waits at the nearest hospital in Spider-Man's area until Spider-Man shows up. The two begin to battle until Sandman interferes and Spider-Man tricks Electro into electrocuting Sandman, turning him into glass. Flying shards of glass hit Electro, temporarily stunning him and allowing Spider-Man to escape. Spider-Man goes on an angry rampage against all the villains after the Chameleon tricks him into thinking the infant is dead. He defeats Electro in Vinegar Hill, Brooklyn. In the Big Time storyline, Electro becomes a member of Doctor Octopus' new Sinister Six and helps Chameleon break into an air force base in New Jersey. Electro was with the Sinister Six when it came to fighting Intelligencia. During a conflict between the Intelligencia and the Sinister Six, Mad Thinker was able to briefly deactivate Electro's powers, but was caught off-guard when Electro physically attacked him instead, the surprise of the attack allowed Electro to defeat Mad Thinker. During the Ends of the Earth storyline, despite the Sinister Six being prepared for a fight with the Avengers, Electro was the first of the team to be defeated, being hurled into the upper atmosphere by Thor while distracted by his inability to attack Spider-Man's new hi-tech armor. Electro returns to Earth and attempts to avenge himself on Thor by forcing an A.I.M. scientist to convert him to generate protons instead of electrons, but he is defeated when Superior Spider-Man (Doctor Octopus' mind in Spider-Man's body) manages to convert him into a stream of protons and traps him. Superior Spider-Man places Electro in containment next to Sandman in his hidden underwater lab. Electro, Chameleon, Sandman, Mysterion, and the Vulture are later seen as part of a team led by Superior Spider-Man called the "Superior Six". Superior Spider-Man has been temporarily controlling their minds in order to redeem them for their crimes. He does this by forcing them to do heroic deeds against their will, some of which almost get them killed. Every time he is done controlling them, he puts them back in their containment cells. They eventually break free of Superior Spider-Man's control and attempt to exact revenge on the wall-crawler, nearly destroying New York in order to do so. With the help of Sun Girl, Superior Spider-Man is barely able to stop the Superior Six. Electro was seen battling the Punisher in Los Angeles, California. Following the conclusion of The Superior Spider-Man storyline returning the true Spider-Man, Electro comes into the Bar With No Name and is introduced to the Hobgoblin's servants by his friend and bartender Deke. The villains start joking about the gloomy Electro. One mentions how Thor launched him into space. Another about how "Spider-Man" made him part of the Superior Six. And yet another about how Electro was taken out by the Punisher despite the latter's lack of powers. Electro gets angry and starts sparking, but the bartender gets the situation under control by commenting on how bad the Punisher is and with compliments like breaking so many villains out of the Raft, which earned him the respect of Crossbones and Count Nefaria. This does not stop the others, however. Determined to get respect, Electro heads back over to the Raft, ready for another breakout despite Green Goblin having done the same just recently and the fact that it was re-christened as Spider-Island II. He sends a blot of electricity around, but it grows excessively big and Electro cannot turn it off. He finally exhausts all of his power, but when this happens he passes out and many of the villains he tried to break out are now dead. Vowing revenge, Electro soon realizes what caused this to happen to him: experiments conducted by "Spider-Man". Electro later visits his friend Francine Frye and keeps his distance because of his uncontrollable powers. Francine starts to kiss Electro only to end up dying from electrocution. At Peter Parker's behest, Parker Industries is testing out an anti-Electro netting that can capture Electro. Electro is later seen with Black Cat when they raid Eel's hideout where Electro defeats Eel. Electro and Black Cat later crash the meeting between Mister Negative and Phil Urich (who is leading the remnants of the Goblin Underground as the self-proclaimed Goblin King) where they throw Eel's body into the area where the meeting is. During Peter Parker's interview on the Fact Channel, Electro attacks the security team on the channel and Black Cat arrives announcing her demand that if Spider-Man does not show up in fifteen minutes, Peter Parker will be dead. Electro complains about the plan but Black Cat stays determined that Spider-Man will show up, but then Silk arrives to confront them both, giving Peter the time to change into Spider-Man and jump into action aiding Silk. As she battles against Electro and Spider-Man deals with Black Cat, J. Jonah Jameson remains on the channel forcing the cameraman to film the action. Electro fails to stop Silk, but Black Cat redirects one of Electro's bolts into hitting Spider-Man, knocking him down in the process. Electro pressures Sajani into telling him how effective the Anti-Electro traps will be in removing his powers, but Black Cat interrupts their talk in order to ask her how the device works. They both infiltrate the demonstration suiting Electro into the "Fake Electro" costume while Black Cat disguises herself as one of the operators. Black Cat start the machine, further enhancing Electro's power only to be interrupted by Spider-Man and Silk. Electro tries to escape but his insulated webbing protects him by allowing Silk to cover Electro with her webbing. Black Cat changes the plan using the wiring to overload Electro by putting his powers way out of control, shooting his lightning bolts against the helicopter. Silk saves the helicopter and Spider-Man jumps into the machine, using his webbing to cover Electro in order to take him out of there. Electro asks to let go, but Spider-Man remains determined to hold him until they are both saved by Silk who pulls them out of the machine and away from the explosion which failed to kill Spider-Man as Black Cat wanted and she escapes. However, Electro was apparently depowered and taken into custody. As part of the All-New, All-Different Marvel event, a depowered Maxwell Dillon was shown as an inmate at Andry Corrections Facility alongside Lizard. Upon being sprung out of the prison by Rhino, he meets a mysterious red-suited man who offers to restore Electro's powers in exchange for his services. Jackal and Lizard work on the procedure that would repower Maxwell Dillon. When Dillon was reluctant to go through with the procedure, Jackal brings in a woman who Dillon recognizes as Francine Frye minus the piercings and tattoos that are on her body. Dillon agrees to go ahead with the procedure. The Jackal cloned Francine from DNA taken from her charred cheek. Francine observes the Jackal's attempt to restore Dillon's powers, but the experiment fails charging his suit but not his body. Unexpectedly, the DNA in Dillon's saliva that was mixed in with Francine's own DNA attracts the electrical energy to Francine. Desiring more, Francine leans in to kiss Dillon and kills him in the process while absorbing his powers as the resulting action burns Dillon's body. The second Electro, Francine Frye, in the cover of The Amazing Spider-Man vol. 4, #17. Francine Frye is a woman who is a fan of supervillains. At some point, she befriended Electro. At the time when Electro was losing control of his abilities, she was visited by him. When attempting to kiss Electro, Francine died from electrocution. Jackal later revived her as a clone, lacking her piercings and tattoos. She was summoned by Jackal to help persuade Electro to go through with the procedure that would repower him. It turned out that Electro's saliva was mixed in with Francine's DNA, which led to her kissing Dillon enough to kill him and becoming the second Electro. She later encountered Prowler, at the time when he infiltrated New U Technologies. During the chase, Electro accidentally caused the apparent death of Prowler causing Jackal to make a clone of him. During the Dead No More: The Clone Conspiracy storyline, Francine assists Rhino into attacking Spider-Man when he infiltrates New U Technologies. Both of them are defeated. When Prowler has not returned from his mission to Alcatraz, the villains he cloned start fighting again enough for Jackal to send Francine to have Madame Web's clone find Prowler. Francine shocks the answers out of Madame Web's clone as Julia Carpenter feels it on her end. After Julia Carpenter escapes, Francine confronts Prowler as his body starts failing. Prowler tries to escape Francine's wrath in Alcatraz, which proves difficult with her powers and his dying body. Using his weapons, the gift shop, and his strategic thinking, Prowler manages to defeat the simple-minded Francine. When Jackal's police contact Chief Anderson tells him about where the clone of Gwen Stacy is, Jackal sends Rhino and Electro to Horizon University. When they retrieve the Gwen Stacy clone, she tells them to bring Kaine due to his encounter with the Carrion Virus might help in Jackal's research. Anna Marie Marconi persuades them to bring her along too since she also studied Kaine and the drug. Both villains agree to the terms. Electro later assists Doctor Octopus into fighting Spectro, following his failed attempt to make off with a test subject, where she is able to knock him out. Alongside Kaine, Electro was being studied by Doctor Octopus in order to find out how to perfect the "Proto Clone." When Spider-Woman of Earth-65 tries to free Kaine, she is attacked by Electro. When Spider-Woman of Earth-65 leaves Prowler in an alley when he proves to weak to continue, he is found by Electro. Julia Carpenter arrives and fends Electro off as she tells Prowler that Spider-Man's stabilized the human and clone cells. When Electro gets the upper hand on Julia, Prowler sacrifices himself to stop Electro and dies in Julia's arms. Electro is one of the few clones that was able to survive the inverse frequency and got away. Electro later appears as a member of the Sinister Six led by Aaron Davis in a recolored Iron Spider armor. She accompanied them in their mission to steal a decommissioned S.H.I.E.L.D. Helicarrier. An unusually configured magnetic field was created when Max Dillon was struck by lightning while holding live, high-tension wires and a wound reel of one-inch cable, granting him superhuman powers. Electro can generate massive quantities of electricity, theoretically up to approximately one million volts. He can employ this electrostatic energy as lightning arcs from his fingertips, and his maximum charge is more than enough to kill a normal human. When his body is charged to high levels, he becomes superhumanly strong and fast. He can also glide over power lines by using the electricity contained therein for propulsion, and he has on occasion been shown to actually ride on lightning bolts. During a stint in prison, Doctor Octopus gave him the ideas of ionizing metals and sparking the petroleum in the fuel tank of a vehicle as a way to generate explosions. He can charge himself up to make himself more powerful. He can also absorb the energy of electrical equipment such as a power plant to increase his powers further. An experimental procedure heightened his powers, allowing Electro to store and absorb a seemingly limitless amount of electricity. He also seemed to gain the power over magnetism to a certain degree, allowing him to manipulate magnetic fields and move objects in a manner similar to that of Magneto, and could overcome his old weakness to water by using the electromagnetic fields around him to vaporize water before it could touch him. He made Spider-Man beg by stimulating the bioelectric currents in his brain, and was able to defeat Nate Grey by manipulating said currents in Nate's brain to turn his own psionic powers against him. Electro can override any electrically powered device and manipulate it according to his mental commands. By using an external electrical power source to recharge his body's energy reserves, Electro could expend electricity indefinitely without diminishing his personal reserves. When he is fully charged, Electro is extremely sensitive to anything that may "short circuit" him, such as water. Electro propels himself along magnetic lines of force in objects that have great electrical potential, such as high-tension electrical lines. He can also create electrostatic bridges to traverse upon, at the cost of a great expenditure of energy. In the House of M reality, Electro is one of Rhino's friends (along with Vulture and Ox) who helped him attack and detain the Green Goblin for ruining the best chance at a good life Rhino ever had. Another Electro appears as a member of the Sinister Six that battles the reality-jumping zombie Spider-Man. When the zombified Spider Man is behind him, he was bitten on the hand. Then Electro is decapitated and infected, later helping his fellow members in devouring Peter Parker's friends. Angered and devastated, the zombie Spider-Man then obliterates his body for what he and the team has done when his arm is snapped off and Spider-Man uses his powers against him. In the MC2 alternate future, Electro has a daughter, Allison Dillon, who is emotionally troubled over never having had a stable father-figure in her life and becomes the supervillain Aftershock. She had inherited her father's powers, but because Dillon and Allison's electrical auras are different, the slightest touch causes them intense pain. When Dillon discovers his daughter is following in his footsteps, he asks Spider-Man for help. Spider-Man, Spider-Girl, and the Avengers help subdue Aftershock. When Dillon shows up, father and daughter vow to overcome their pain, and Max promises to be a better father. In the pages of Old Man Logan, Electro was among the villains that came together to eliminate every superhero. He accompanied Enchantress in fighting She-Hulk, Daredevil, and Moon Knight in Manhattan. Electro shocked Moon Knight into unconsciousness before being shot in the head by Punisher. Kraven the Hunter later stabbed Punisher in the back and avenged Electro. When the villains have won, an area of Amerika was named after Electro called Electroville. In the Spider-Man: Reign reality, Electro is one of the villains released by Edward to destroy Spider-Man; he is killed by Spider-Man after being knocked into Hydro-Man (who also dies) causing him to short circuit. Electro is Shiraishi, a mechanic who falls into massive debt after he accidentally hits a child with his car, leaving the boy permanently disabled. Desperate for money, Shiraishi takes on a number of odd jobs (the last of which he robs) before being contacted by the handicapped boy's father, a professor researching high-voltage emission technology. Shiraishi agrees to be a test subject for the professor's experiments, and is given superhuman abilities through "electrification devices" he is implanted with. The professor convinces Shiraishi, who is dubbed "Electro" by the media, to use his electrokinesis to rob banks, but the professor begins to have second thoughts when Shiraishi's greed proves insatiable, and he begins to murder people who get in his way. While robbing a department store, due to the banks now being too heavily guarded, Electro is challenged by the new hero Spider-Man. During his battle with Spider-Man, Electro accidentally kills the professor, the only person who knows how to remove his powers, which leave him unable to touch any living thing without shocking them. The distraught and enraged Electro is then fatally punched by Spider-Man, and before dying explains his origin, and has his mask removed to reveal that he is the missing brother of Spider-Man's friend, Rumiko, who Spider-Man was trying to get money for by claiming the reward offered to anyone who could defeat Electro. 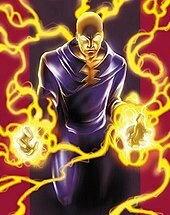 A version of Electro is a member of the Six Men of Sinestry of the dimension Earth-803. He caused a blackout to enable the group to execute their move in stealing the mayor's plan and after a battle with Lady Spider, was forced to retreat after they were overwhelmed yet they were able to accomplish their mission. The Ultimate Marvel incarnation of Electro has been reimagined with powers as a product of bioengineering. Unlike his mainstream counterpart, this version is bald, wears a black leather outfit and has some grotesque burn scars. As a result of experimentation by Justin Hammer, Max Dillon is given the power to control and create electricity. He is sold by Hammer to the Kingpin in exchange for a real estate development contract. When Spider-Man breaks into Kingpin's office, Electro electrocutes him and he, the Enforcers, and Kingpin unmask him, revealing him to be a teenager. They decide to throw him out a window but Spider-Man returns and defeats him. Electro later escapes from federal custody, murdering several people in the process. The Ultimates re-apprehend him and place him in S.H.I.E.L.D. custody along with Sandman, Kraven the Hunter, Doctor Octopus and Norman Osborn but the five supervillains escape and become the Ultimate Six. They attack S.H.I.E.L.D. and manage to capture Spider-Man. They tie him to a chair, torture and humiliate him, and force him to join them. In a battle with the Ultimates on the White House lawn, Thor defeats Electro. He eventually escapes and is hired by Bolivar Trask to gauge Venom's power. Electro leads Venom on a chase throughout Manhattan when Spider-Man appears. Electro knocks Spider-Man out and tries to kill him, but Venom attacks Electro, trying to take Electro's opportunity to kill the fallen hero. Venom defeats Electro by destroying the neon signs that Electro is feeding on. When S.H.I.E.L.D. arrives Venom flees, and Electro is once again brought into S.H.I.E.L.D. custody. The Green Goblin later breaks Electro out of the supervillain prison within the Ultimates' headquarters, the Triskelion, in exchange for Electro's alliance when needed. Electro goes to Osborn's penthouse to wait for instructions where he is disturbed by Spider-Man. He attempts to flee and gets involved in a fight both with Spider-Man and S.H.I.E.L.D. agents. He is eventually brought down and is assumed to be back in custody. Alongside the rest of the Ultimate Six, Electro plays a role in the "Death of Spider-Man" storyline. Norman breaks him and the rest out of the Triskelion and wishes for them to kill Peter Parker. After Doctor Octopus tries to leave the group but is killed by Green Goblin, the remaining five (Electro, Green Goblin, Sandman, Kraven and Vulture) go to Parker's home in Queens. There a fight ensues between the Five and both Johnny Storm and Bobby Drake. The two heroes are defeated, with Electro himself defeating Iceman by sending a jolt of electricity through his ice, but not before Johnny manages to knock Osborn out. Peter then arrives, wearing his Spider-Man costume but no mask, and proceeds to fight the four remaining members. After a pitched battle, Electro is about to deliver the killing shot on the beaten and exhausted Peter. But before he can strike, Electro is shot three times from behind by Aunt May. He 'short circuits' in a massive electrical surge, taking out Kraven, Sandman and Vulture. Later, Electro is shown to have survived the shooting, and is being held in S.H.I.E.L.D. custody. Electro is able to power up and attempt an escape after being improperly sedated by a S.H.I.E.L.D. nurse. After taking down the Ultimates, Electro fights Nick Fury and the new Spider-Man (Miles Morales), thinking Miles is the original and angry that he is still alive. Morales stuns Electro by hitting him with a hurled crate, then Fury shoots him to end the threat. Electro later resurfaces, fighting Sabretooth over something relating to Norman Osborn. The two are broken up and defeated by Miles, with help from Cloak and Dagger. When Miguel O'Hara finds himself in an alternate version of 2099 after being trapped in the past, he encounters a 2099 version of the Sinister Six, which includes an android that calls itself 'Electro' after it gained sentience and electromagnetic powers in a lightning strike. Electro made a cameo appearance on The Marvel Super Heroes episode "Dr. Doom's Day" (which was a Sub-Mariner segment). Electro made three appearances in the 1960s Spider-Man animated series, voiced by Tom Harvey. In his first appearance in the episode "Electro the Human Lightning Bolt", he robs J. Jonah Jameson's house which Spider-Man is blamed for. Finally, he is defeated at an amusement park with a new webbing that conducts electricity. Spider-Man then hangs the webbing containing Electro outside of the window to Jameson's office. In the episode "Killowatt Kaper", he breaks out of jail using a metal kite during a storm to recharge himself. He then tries to force the city to pay him a fortune by turning off the electriciy, but is caught in a giant electric spider web by Spider-Man which powered up the light signs put together by Spider-Man that says to the authorities below "Do not touch until this battery runs dry". In the episode "To Catch a Spider", Dr. Noah Boddy springs Electro, Green Goblin and Vulture from prison and coordinates them into attacking Spider-Man. But Spider-Man makes them fight each other using ventriloquism; Electro blasts the Vulture from the sky, then is knocked out by a pumpkin bomb thrown by Green Goblin and left webbed up with Green Goblin and Vulture as Spider-Man catches Dr. Noah Boddy. Electro appears in Spider-Man and His Amazing Friends, voiced by Allan Melvin. In the episode "Videoman", he creates Videoman in order to help him defeat Spider-Man, Iceman and Firestar. Electro later made a cameo appearance in the episode "Attack of the Arachnoid" where he was seen as an inmate at Ryker's Island. Electro appears in the "Six Forgotten Warriors" storyline of Spider-Man: The Animated Series, voiced by Philip Proctor. This version is Rheinholt Schmidt, a German who has masqueraded as Russian police chief Rheinholt Kragov for most of his life. He spent many years searching for his father Red Skull and then impersonated his father in an attempt to gain control of the doomsday weapon, an unknown aid in which his father believed would help the Nazis win World War II. When he had trapped Spider-Man, Kingpin and the Insidious Six, Kingpin unmasked Red Skull to be Rheinholt where Kingpin commented that the real Red Skull would have broken free from his grip. The encounter with Kingpin and the Insidious Six left him without the box containing the secret information on the project. After his step-brother Chameleon turned traitor on Kingpin, he had the box and all the keys to use the Doomsday weapon. After Red Skull was freed from the vortex, he used the Doomsday weapon on Kragov transforming him into Electro. Angry at his father for risking his life with the Doomsday Device, he decides to take over the world himself. However, Spider-Man tricks Rheinholt into being trapped in an energy vortex, which is then destroyed. A Counter-Earth version of Electro appears in Spider-Man Unlimited, voiced by Dale Wilson. He is a Bestial electric eel possessing electrokinesis. In the episode "Ill-Met By Moonlight", Electro is a guard in the High Evolutionary's main base Wundagore Castle. Throughout his fight with Electro, Spider-Man also references the original Electro. Electro in Spider-Man: The New Animated Series. Electro appears in Spider-Man: The New Animated Series, voiced by Ethan Embry. Max Dillon is Peter Parker's geeky high school friend who attends Empire State University. He first appears as a college friend of Parker's in the episode "Head Over Heels" in a minor role. In the subsequent episode "The Party", he is transformed into an electrical creature after being covered in an unknown substance and then struck by lightning. He immediately pursues revenge on fellow students who bullied him, even killing their leader Doug Reisman before Spider-Man weakened him and forced him to retreat into an underground electrical system. Electro reappears in the episode "When Sparks Fly" where he had been hiding out to regain his power. He planned to transform Sally Thompson, a girl he liked into a being like himself for companionship. Electro was trapped in a HVSC (High Voltage Storage Container) battery by Spider-Man, Mary Jane Watson and Harry Osborn, then thrown to the bottom of the Hudson River. Electro in The Spectacular Spider-Man. Electro appears in The Spectacular Spider-Man, voiced by Crispin Freeman. In the episode "Interactions", Maxwell Dillon is electrocuted in a freak accident after his power drill falls onto a damaged computer console: when he tries to pick it up, the resulting electrical shock sends him flying against a specialized tank holding genetically altered electric eels, becoming exposed to the substance inside. Although Max survived, his body became an unstable living electrical capacitate. He is then forced to wear an insulated body suit to contain the bio-electricity being produced in order to protect others around him, especially his face which had transformed into an electrical field. After an encounter with Spider-Man, Max goes berserk and takes up the name 'Electro' . Electro then rushes out to Doctor Connors's lab, demanding that Connors cure him. He is interrupted by Spider-Man again and the two battle. Spider-Man defeats Electro by tossing him into a swimming pool which short-circuits him, knocking him unconscious. Electro reappears in the episodes "Group Therapy", "Reinforcements", and "Growing Pains". In the first season he desires to be cured of his "condition" but in the second season, he seems to have embraced his powers, to the point where he despises being called by his real name. Electro appears on the Ultimate Spider-Man animated series, voiced by Christopher Daniel Barnes. Before the events of the series, Electro previously fought Spider-Man several times. Spider-Man acknowledges that while having once considered Electro a serious villain, training with S.H.I.E.L.D. makes the villain incompetent. In his self-titled episode "Electro", he is tasered by Spider-Man against J. Jonah Jameson's large television screen, but Electro manages to disappear into the screen. Electro then appears in a hyper-electrified form (a homage to the Ultimate Marvel version of Electro) and holds the city's electricity for ransom. Electro takes over Spider-Man's Spider-Cycle which takes the web-slinger's team straight into town. Spider-Man manages to anticipate where Electro is as Electro charges the tram Spider-Man's team is on towards its station. Spider-Man's team finds Electro in a part of town where he starts to turn some of the nearby electronic devices into weapons. Electro then attacks Spider-Man as he remembers that the large television screen had super-charged him. Electro then heads to the Federal Reserve as Spider-Man and Nova follow him. Electro then takes over Spider-Man's electrical web containers and fires at a building crane as a diversion so that he can get into the Federal Reserve. Spider-Man's team catches up to Electro in the vault as Spider-Man tells the S.H.I.E.L.D. trainees that they must act like a team to take down Electro. Spider-Man comes up with a plan that involves Electro heading to the satellite above the Daily Bugle which launched him into the orbiting satellites. After Batroc the Leaper's defeat, Spider-Man swings towards the large television screen that Electro is in. As Electro emerges from the screen, Spider-Man's team takes out the Electro clones that emerge from their electronics. Electro loses control and emerges from the screen in his normal form confused from being overloaded with information. Spider-Man then knocks out Electro. Electro returns in hyper-electrified form for subsequent episodes. In the episode "The Sinister Six", Electro appears as a member of the Sinister Six alongside Doctor Octopus, Rhino, Kraven the Hunter, Beetle and Lizard. During the fight at the Statue of Liberty between the S.H.I.E.L.D. trainees and the Sinister Six, Electro fights Iron Fist but was defeated by Nova when Spider-Man's teammates switched opponents. When most of the Sinister Six members were apprehended by S.H.I.E.L.D., Electro anchored down in his cell in which he is standing surrounded by water. In the episode "Return of the Sinister Six", Electro is sprung from Ryker's Island and equipped with stolen OsCorp tech with the armored Sinister Six. Electro fights Spider-Man then Nova and assists the group's gang assault on Iron Patriot but is eventually defeated by Spider-Man. In the four-part "Spider-Verse" story arc, Electro gets trapped within the enchanted Siege Perilous ruby gem by Green Goblin to collect the DNA of Spider-Man 2099, Spider-Girl, Spider-Man Noir, Spider-Ham, Spyder-Knight and Ultimate Spider-Man. At the end of the adventure, Spider-Man uses Electro to bring the Web-Warriors to help defeat Spider-Goblin. Electro then takes control of the fallen Helicarrier which he transforms into a giant robot, going on a rampage until he is stopped by the Web-Warriors. In the episode "The New Sinister 6" Pt. 2, Electro appears as a member of the Sinister Six at the time when they attack the Triskelion. A female version of Electro appears in Spider-Man, voiced by Daisy Lightfoot. This version is an unnamed female African-American teenager who uses uses an exoskeleton to acquire electrical powers. In the episode "Bring on the Bad Guys" Pt. 4, Electro is the final villain attempting to collect the bounty placed on Spider-Man and ambushes him on his way to Horizon High's Open House while constantly having to recharge her exoskeleton. After using a Power Amplifier made by Peter Parker, Electro transforms into a being of electrical energy (a homage to the Ultimate Marvel version of Electro). She caused significant damage to Horizon High's Open House until Spider-Man (using a hand-made electoproof suit and energy-absorbing gauntlets from components from the other projects) defeats her, returning Electro to normal. Spider-Man then webs her up for the police and gives the absorbed electricity to Max Modell, who cancelled the Open House due to damages caused by Electro. Jamie Foxx as Electro in The Amazing Spider-Man 2. Jamie Foxx portrays Maxwell "Max" Dillon / Electro in the 2014 film The Amazing Spider-Man 2. Foxx revealed that the character was redesigned to be more grounded, and that the villain's classic yellow and green suit would be omitted in favor of a modern look. This incarnation of the character is African-American, as opposed to being Caucasian in the comics. In the film, Max Dillon is an electrical engineer at Oscorp and a "nobody" who idolizes Spider-Man after being saved by him in a battle against Aleksei Sytsevich before getting transformed in an accident while fixing a power line, electrocuting him and causing him to fall into a tank full of genetically-engineered electric eels. He realizes that his newly gained powers make the world finally recognize him, having been shunned, humiliated and ignored his entire life. Having become mentally unstable, he is confronted by Spider-Man in Times Square, where he mistakenly believes Spider-Man is attempting to steal his newfound fame and betray him. After a brief battle, Dillon is subdued and held captive in Ravencroft to be studied where he adopts the name "Electro", but is later broken out by Harry Osborn who requires his help to break back into Oscorp to find a cure for his own terminal illness. Electro agrees and is given a new suit to control his powers. After they successfully break into Oscorp, Harry allows Electro to take over the electrical grid he designed, manipulating it to control the electricity in New York so that the citizens will be at his mercy. After having magnetized his web-shooters to prevent them from being damaged by Electro's powers, Spider-Man once again confronts Dillon, and during their battle is able to reconnect the damaged electrical grid, allowing Gwen Stacy to reactivate it. This allows Spider-Man to overload Electro with his own electricity, causing his body to explode. Electro is a boss in the arcade game Spider-Man: The Video Game; in the Game Boy Advance game Spider-Man: Mysterio's Menace; and in the home games Spider-Man: Return of the Sinister Six; The Amazing Spider-Man vs. The Kingpin, at a level set in a power station. Electro appears in the game Spider-Man and Captain America in Doctor Doom's Revenge. Electro appears in The Amazing Spider-Man 3: Invasion of the Spider-Slayers. Electro appears as a boss in the Ultimate Spider-Man video game, voiced by James Arnold Taylor. Electro appears as a boss in the Game Boy Advance version of the Spider-Man 3 video game in the "Totally Amped" level. Electro is a boss and a playable character in the PSP version of Spider-Man: Friend or Foe, voiced by David Kaye. Electro appears in Spider-Man: Web of Shadows, voiced by Liam O'Brien. In the game, he is looking for his sister amongst the chaos. He finds her at a camp for symbiote-infected citizens, but is shot by Black Widow to restore order. His sister rushes over to him, accidentally infecting Electro with her symbiote. The symbiote heals Electro, turning him into a feral monster obsessed with absorbing electricity. He gains the power to create his own pods, which can fire electricity and warp another infected citizen into an electric symbiote. Spider-Man confronts and frees him of the organism's control. Depending on the choice, Electro may fry the symbiote that possessed him in grief. Electro appears in Marvel: Ultimate Alliance 2, voiced by Kirk Thornton. Electro appears in Spider-Man: Shattered Dimensions, voiced by Thomas F. Wilson. The Ultimate incarnation is a boss against Ultimate Spider-Man. He takes over an electric dam, using the energy generated to increase his power to the point where he becomes a giant. Spider-Man beats him by tricking him into destroying the dam, causing him to "drown" with all the water. During the credits, he is in a park sheepishly covering up with a tree branch as a tie-in to the "pants" comment that Spider-Man kept making. In the game's Nintendo DS version, the original version appears as a boss against Amazing Spider-Man. Electro appears in Marvel Heroes, voiced again by Liam O'Brien. Electro appears as a boss and playable character in Lego Marvel Super Heroes, voiced by David Sobolov. In a bonus mission, Electro and Shocker collaborate to rob a bank in the Financial District. Both of them are defeated by Spider-Man, Captain America, and Iron Man. Electro appears in the video game The Amazing Spider-Man 2, voiced by Michael A. Shepperd. Various incarnations of Electro appear as bosses in the Spider-Man Unlimited video game, with Christopher Daniel Barnes reprising his role as all of them. Electro appears as a playable character in Lego Marvel Super Heroes 2. Electro appears in the 2018 Spider-Man video game, voiced by Josh Keaton. This version of the character is bald-headed and has scars on his face that resemble his iconic yellow-star mask. Alongside Rhino, Scorpion and Vulture, he is one of Spider-Man's oldest enemies, having already fought him several times in the past, and, some time prior to the events of the game, was defeated by Spider-Man and imprisoned in the Raft, a maximum security prison designed especially for super-villains. After Otto Octavius (now calling himself "Doctor Octopus") attacks both Ryker's Island and the Raft, Electro, Rhino, Scorpion, Vulture and Mister Negative are all released and Otto recruits them to form the Sinister Six, promising to fulfill each one's desires (with Electro wishing to become a form of pure energy). When Spider-Man comes to investigate the break out, he is easily defeated by the combined forces of the Sinister Six, although Otto orders them not to kill him (because, as it is revealed at the end of the game, Otto is aware of Spider-Man's secret identity). The Sinister Six then split up to fulfill their respective tasks, with Electro and Vulture being sent to cripple the city's power supply. After being lured into a trap by Otto, Spider-Man survives, only to be captured by Vulture, who brings him to Electro, so that togheter they could finally kill the web-slinger. However, Spider-Man manages to defeat both Electro and Vulture, stopping them from cutting down the power in the city, and leaving them for the police to take them back into custody. Electro is one of the villains on The Amazing Adventures of Spider-Man ride at the Islands of Adventure theme park at Universal Orlando Resort, voiced by Jim Wise. He is a member of the Sinister Syndicate, and attacks guests with an electrical power cable to shake their vehicle with electricity. During the climax on the rooftops of New York, he attacks Spider-Man but hits Hydro-Man instead, accidentally knocking himself out due to his exposure to water. He is last seen webbed up with the rest of the Syndicate. Electro also appears as a member of the Sinister Six in Julie Taymor's Broadway theatre show based on the comic series, Spider-Man: Turn Off the Dark, in which he was originally played by actor Emmanuel Brown. Electro appears in the Marvel Universe: LIVE! stage show. During an interview with Newsarama about The Gauntlet and Grim Hunt, Mark Waid claimed that the character of Electro is "one of the smart criminals who was saving what he's been stealing from banks and savings and loans". He also described Electro as the "anti-bailout guy". A Comics Bulletin review published by Ray Tate of Young Allies #2 described Electro’s appearance in that issue as "a punk with a gimmick". He also claimed that the character "never harbored a pathological hatred of Spider-Man", and that he instead "developed a healthy loathing for Spidey because the Wall Crawler frequently interfered with his sole goal of larceny". Ray believes that Electro "isn’t a wanton psychopath", but a "bank robber with electrical powers", and that he is "not nuts" but "a felon". These remarks show that Electro’s character is received not as being mentally ill, but simply a thieving villain. ^ "Electro is number 87 on greatest comic book villain of all time". IGN. Retrieved January 3, 2014. ^ Booke, M. Keith (ed.). "Daredevil". Encyclopedia of Comic Books and Graphic Novels: Two Volumes. p. 134. ^ "IGN.com "Spider-Man: Enter the Gauntlet"". ^ Scott Chitwood (February 15, 2000). "Review of James Cameron's Spider-Man Scriptment". IGN. Archived from the original on August 23, 2011. Retrieved April 28, 2007. ^ Larry Brody and Robert Gregory-Browne (writers) (February 17, 2001). "Ill-Met By Moonlight". Spider-Man Unlimited. Season 1. Episode 8. Fox Broadcasting Company. ^ "Interactions". The Spectacular Spider-Man. ^ "Group Therapy". The Spectacular Spider-Man. ^ "Reinforcements". The Spectacular Spider-Man. ^ "Growing Pains". The Spectacular Spider-Man. ^ "Bring On the Bad Guys Pt. 4". Spider-Man. Season 2. Episode 36. August 6, 2018. Disney XD. ^ "Electro confirmed as The Amazing Spider-Man 2's main villain". YahooMail. November 22, 2013. Archived from the original on December 3, 2013. ^ "The Amazing Spider-Man 2 Electro Costume Is Getting a Modern Redesign". Movieweb.com. December 17, 2012. ^ Carr, Jason. "Spider-Man: Friend or Foe". IMDb. IMDb. Retrieved February 11, 2016. ^ Ricardo Torres (April 3, 2009). "Marvel: Ultimate Alliance 2 Updated Impressions: Secret Wat in Castle Doom – Xbox 360 Previews". GameSpot. Archived from the original on July 4, 2009. Retrieved April 11, 2009. ^ "LEGO Marvel Super Heroes – #EGX 2013". Retrieved September 28, 2013. ^ "Spider-Man PS4 Release Date, E3 2018 Gameplay, Hands-On Preview Impressions, Sinister Six Villains – Everything We Know". USgamer. June 15, 2018. Retrieved June 20, 2018. ^ Electro, About the Artists, accessed February 12, 2011. ^ Vaneta Rogers (June 19, 2009). "Heroes Con '09: Waid & Guggenheim Run 'The Gauntlet'". Newsarama. Retrieved July 20, 2011. ^ Ray Tate (July 9, 2010). "Young Allies #2 Review". Comics Bulletin. Retrieved July 20, 2011. This page was last edited on 24 April 2019, at 14:29 (UTC).